Wonderful fail today from .. someone. We have no idea who and we don't really care. We get lots of threats, both threats of violence to ourselves and our families, when on occasion one of our Mods are identified. 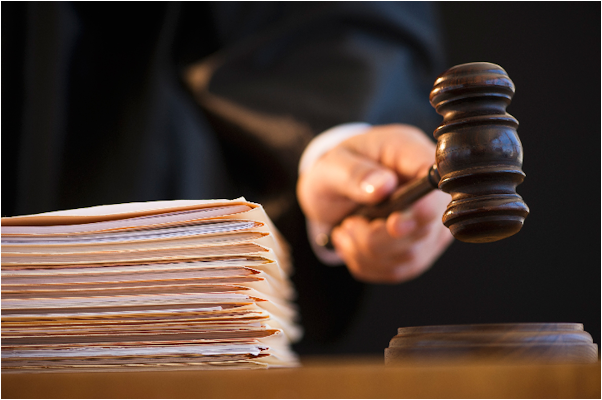 But quite often we get legal threats of actions for libel or defamation. 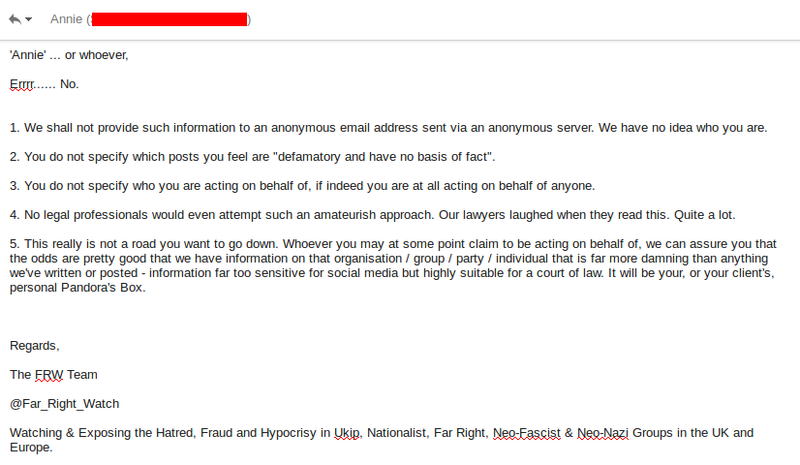 We've had these from Ukip Officials, Britain First Officials, and individual Neo Nazi extremists. It seems to be a popular response. None of these threats have of course ever - ever - resulted in action. Please can you send me details of your legal department? I need this information by 5 pm today. Do you share the same team as Hope not Hate? As per my two earlier requests...Please expedite now. Seems quite insistent, doesn't she? Desperate for our attention, even. Honestly, whoever this 'Annie' is, do you think we're new at this game? If you're going to troll us by email at least do it right. 1. We shall not provide such information to an anonymous email address sent via an anonymous server. We have no idea who you are. 3. You do not specify who you are acting on behalf of, if indeed you are at all acting on behalf of anyone. 4. No legal professionals would even attempt such an amateurish approach. Our lawyers laughed when they read this. Quite a lot. 5. This really is not a road you want to go down. 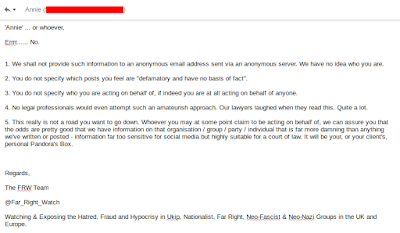 Whoever you may at some point claim to be acting on behalf of, we can assure you that the odds are pretty good that we have information on that organisation / group / party / individual that is far more damning than anything we've written or posted - information far too sensitive for social media but highly suitable for a court of law. It will be your, or your pretend client's, personal Pandora's Box. "You are wrong. You haven't checked out the information which is 100% incorrect and being provided to you by people you haven't checked out at all. There are people that you are reliant upon because they have grudges against people. You are not employing due diligence at all. Since you are ably supported by monied organisations such as Hope not Hate, then you have funds which you are going to require for out of court settlements. I will continue to screenshot for evidence and respond shortly."